At WK360 our Print department is designed to offer something different. It is flexible, reactive and above all, innovative. We are inventive with printed products but also with linking digital content to print. Our unique mix of content creation, digital development and print means that we can provide a seamless approach to multi-channel campaigns. Our passion for colour means that our colour control is second to none and the depth of knowledge from our Client team means that we can help you on all kinds of levels, from data to digital, to print management and print finishing. High quality retail graphics for brands that need something special. We provide print solutions for retailers where colour and finish is a prime concern - for example, for fashion and accessories retailers, and where there are complex fulfilments required for multiple stores and concessions. With a range of products from window posters and wrapped strut cards for that high quality finish, zig zag counter stands that tell a story to engage your customers, swing tickets and shelf strips, we can produce entire suites of POS and store graphics for your next campaign. Working with a host of high-end retailers, we specialise in retailers with one store up to two hundred stores, creating highly finished material where quality is uncompromised. We provide print for creative agencies and print managers when they want something different. Our digital print facility uses Xeikon technology and latex to print to an extremely high standard but we add value with technology and specialist print finishing, such as personalised foiling and holographic finishes. Technology also plays a part with our own Smarker software that links print and digital channels together and allows you to measure the ROI on campaigns. If you need to get ahead and offer something different to your clients, then talk to our print team about your next project. Decorating your workspaces with a solution from WK360 will help to brighten the dullest area and help to invigorate staff and promote creativity. At WK360 our Design team will create something that communicates your message, and our Print team will print and install high quality wall coverings, floor graphics, magnetic walls for offices, receptions and meeting rooms. 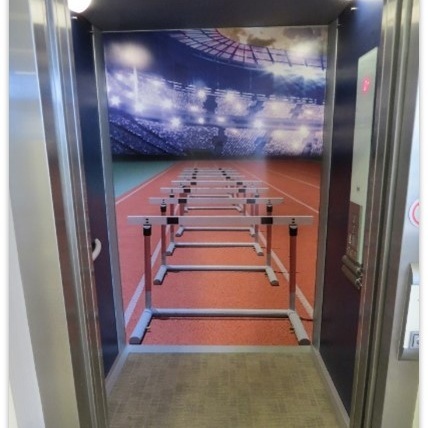 Being creative with your workspace graphics can lead to some great effects, we’ve even created the illusion of the Olympic Stadium in an elevator! Growing business with smart brochures from WK360. We help sales teams better understand how their customers interact with their printed material with our smart brochures that text you when a customer is interacting with digital content linked to your brochure. For more traditional outlets, we provide a variety of everyday products such as six and eight page roll folds, landscape publications, variable data A2 posters, pull-up banners and more.